Cornbread Supreme. Oh Lordy. I think we've made this dish 4 or 5 times in the last two months. It is so gooooood. Especially with Calico Beans. Mmm. I think I may have to make it again this week. I'm getting cravings...Mmm. 1. In a large bowl, combine cornbread mix, sour cream, butter, whole kernel corn, cream style corn, and eggs. 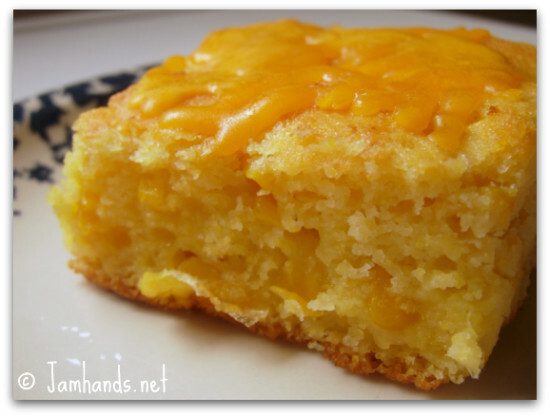 Place in a lightly greased 9" x 13" baking dish and sprinkle with 2 cups shredded cheddar cheese. Bake at 350-f degrees for 45 to 50 minutes or until golden on top and cooked through. Horray, I am so happy that you are back!!! Your new blog is wonderful and Violet is a happy, beautiful welcome additon! Looking forward to more inticing recipes.. I LOVE this recipe, got the recipe from my aunt a few years ago, and it is a MUST MAKE whenever hubby makes his special slow-smoked ribs on a Saturday afternoon. The only thing I add to your recipe is a can of green chiles. It is also phenomenal (as you note) with a bowl of beans. I just made this with a giant pot of Creamy white chicken chili this weekend for my family and guests. EVERYONE loved it from age 66 to age 2 and I had to give out the recipe. I already saved this cornbread recipe to make for my family of cornbread lovers. I can't wait to try it! I'm making this in a few! Can't wait! Happy Thanksgiving!!!! I'm making this for Thanksgiving. It will be the bottom layer of a seven layer cornbread salad.